Podcasting is a popular method, designed specifically for iPods, of publishing audio and video shows to the Internet, enabling people to subscribe to a feed and receive the shows automatically. Similar to a tape of a radio broadcast, you can save a podcast episode and play it back at your convenience, both in iTunes on your computer and on your iPod. You can also burn an audio podcast episode to an audio CD or MP3 CD. Subscribing means listing the podcast in the Podcasts section of your iTunes library so that new episodes download automatically. It’s like a magazine subscription that’s updated with a new issue every month or so. 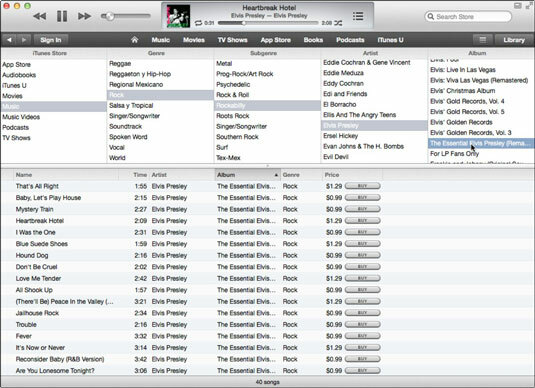 Your copy of iTunes automatically finds new podcast episodes and downloads them to your computer. A podcast episode can be anything from a single song to a commentary-hosted radio show; a podcaster, like a broadcaster, provides a stream of episodes over time. Thousands of professional and amateur radio and video shows are offered as podcast episodes. Video podcasts are also called videocasts or vodcasts. Click the Podcasts tab at the top of the iTunes Store page. The iTunes Store displays the Podcast page, with advertisements for popular podcasts. You can click the down-arrow button next to the Podcasts tab to choose specific categories. You can also get to the Podcast page by clicking Podcasts in the iTunes source list, clicking the List tab to see your podcasts, and then clicking Podcast Catalog at the bottom of the list. Browse all podcasts in a particular category. Use the column browser and select Podcasts in the iTunes Store column. Select options from the Category column and Subcategory column. Search for a podcast by name or keyword. You can type a search term into the Search Store field in the upper-right corner of the iTunes window to find any podcasts or other content items that match. You can also find podcasts outside of the iTunes Store on the Internet. Choose a podcast in the iTunes Store. The iTunes Store offers a description and a Subscribe button to receive new podcasts. The page also lists the most recent podcast episodes. You can click the i icon on the far-right listing margin to display separate information about each podcast episode. To preview the podcast, click an episode title, and then click the play button next to the title. You can play a preview of any episode in the list. iTunes plays the episode for about 90 seconds, just like a web radio station streaming to your computer. To jump ahead or play the entire episode, you must first subscribe to the podcast. By subscribing, you enable automatic downloading of episodes to your computer. Click the Subscribe button on the podcast page to subscribe to the podcast. In typical Apple fashion, iTunes first displays an alert to confirm that you want to subscribe to the podcast. iTunes downloads the podcast. iTunes displays your newly subscribed podcast in the Podcasts section of your library. (Optional) Get more episodes of the podcast. When you subscribe to a podcast, you get the current episode. However, a podcast probably has past episodes still available. To download any free or commercial episodes, click the Free or Buy button at the far-right side of the episode. You can play the podcast, incorporate it into playlists, and make copies and burn CDs as much as you like.